During the installation of Elvis 5 Server, basic configuration settings were made. Once the cluster is up and running, additional properties can be configured to further unlock functionality and features. As was the case during the installation, configuration can be done for each specific node and for the cluster itself. This article describes how to do both. 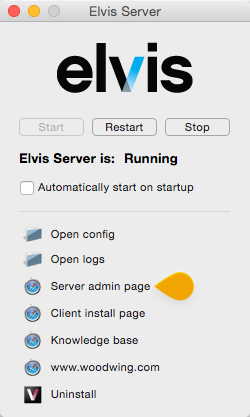 To restart or not to restart Elvis Server? A common question that is asked is whether or not Elvis Server should be restarted after making changes to the configuration files. Step 2. Change any of the properties as explained in the comments of the file. Step 4. Restart Elvis Server when needed. During the installation of Elvis 5 Server the cluster properties were configured by manually modifying the cluster-config.properties.txt file. 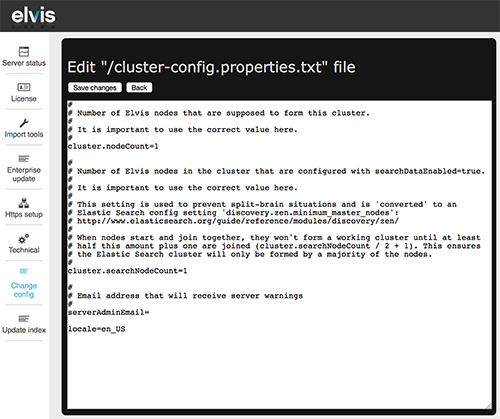 Once the cluster is up and running though, changing the cluster properties should be done through the Elvis Config Properties page on one of the nodes. After saving the changes, Elvis will automatically distribute the changes across all other nodes. Important: Modifying the cluster-config.properties.txt file on a node in a running cluster by manually opening it from the Elvis Server/Config folder should not be done; this can result in nodes with different cluster properties which can lead to unpredictable behavior. Step 2. Click Change config in the menu bar. 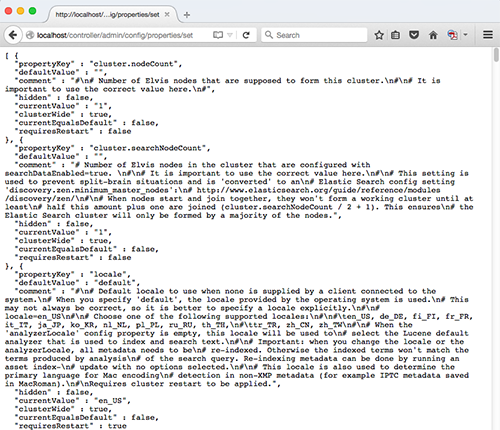 An overview of the available properties, their description and whether or not changing them requires a cluster restart can be found by clicking List config properties at the top of the page under 'Config properties'. To see the properties that are currently set for the cluster, click any of the links in the 'Choose a file' section. This will open that particular file for editing. Figure: The content of the cluster-config.properties.txt file, showing the properties set for that file for the whole cluster. Step 1. In the Choose config file section, click any of the links to open the file. The page for changing the file properties appears. Step 2. Add or change a property with its value and click Save changes. Tip: For files with a lot of content it might be handy to copy the content to your favorite text editor such as TextWrangler or Notepad++ so that you can easily read and edit the configuration settings. When finished editing, paste the content back into the Elvis page. Step 3. Restart Elvis Server when needed. Step 1. 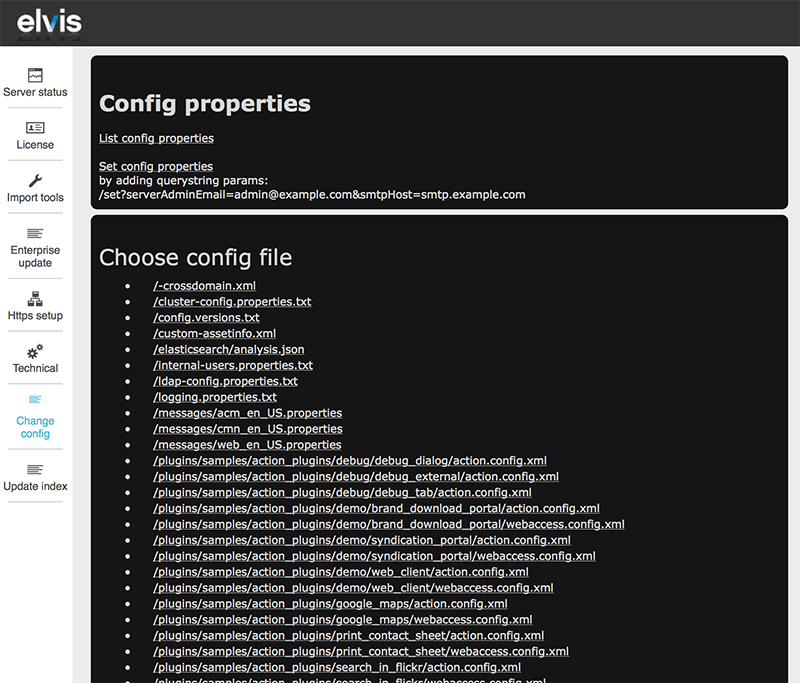 In the Config properties section, click Set config properties. A page showing all properties that can be set appears. Step 4. Press Enter to run the command. Step 5. Verify on the page that the value of the property has changed. Step 6. Restart Elvis Server when needed.